The 2015 federal election brought about a number of significant firsts — not only did a Liberal majority defeat a decade of a Conservative government, Canada made strides in representing its diverse and multicultural identity by electing a record 88 women, 10 Muslims, and 10 Indigenous Members of Parliament (MPs), including its first MPs of Somali and Afghan decent. This year’s election saw a seven per cent rise in voter turnout. Around 68 per cent of eligible voters voted this year, a noteworthy peak in the two decades since 1993. The House of Commons is now comprised of 184 Liberals, 99 Conservatives, 44 New Democrats, 10 Bloc Quebecois, and one Green. Liberal candidates prevailed in all three ridings that encompass U of T campuses — University-Rosedale, Scarborough-Rouge Park, and Mississauga-Erin Mills — Chrystia Freeland, Gary Anandasangaree, and Iqra Khalid won with 50 per cent of the vote or more. Perhaps one of the most surprising results of this election was the significant majority win for the Liberals. National public opinion polls show that about a month before Election Day, there was a momentous turn in supporters for the three major parties. Before mid-September, the NDP was in the lead, with the Liberal party rising to second place towards the beginning of September. By the end of September, Liberals were first in the polls, their support rising rapidly, while the NDP fell to third place. There are several speculative explanations for the NDP’s sudden decline, the most popular reason being strategic voting. “I think there was substantial strategic voting in this election, particularly from NDP voters who abandoned that party to support the Liberals,” said Peter Loewen, a political science professor at U of T.
Ferraro believes that Trudeau’s promise to reform the electoral system contributed to the rise in strategic voting. “This sort of gave NDP supporters the confidence to say, ‘not this time.’” Ferraro mentioned that during the last run of the campaign, CBC reported that around one in four NDP supporters had switched their vote. While the NDP faced a severe setback this election, the Conservatives managed to maintain enough seats to be the official opposition. Although the Conservative party lost the election, Matthew Gregory, the outgoing president of the UTSC Conservatives, is more optimistic about the Conservative’s result. With a Liberal majority and Conservative opposition, it will be interesting to see how the new government functions. “They [the Liberals] will be able to implement their agenda, but they’ll also have nowhere to hide if they are unable or unwilling to follow through in their promises. In a minority government situation, they could have reneged on some of their more ambitious proposals in the name of pursuing compromises with the other parties,” said Chris Cochrane, a political professor at UTSC. 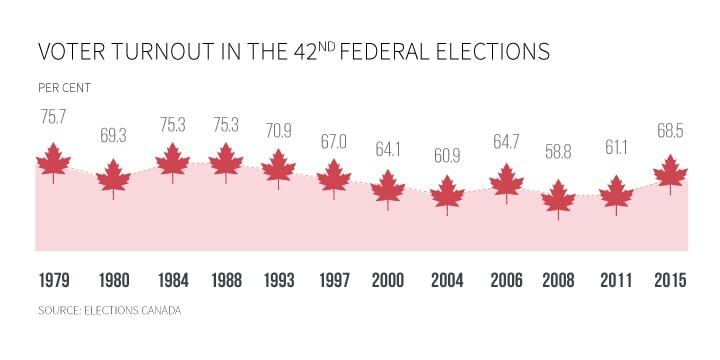 One of Trudeau’s main policy objectives includes replacing the current first-past-the-post system to a more proportional electoral system. If it does follow through, it will mean substantial change for the strategies employed in the next electoral campaign. According to Elections Canada, over 70,000 students voted at polling stations on university campuses. Natalie Petra, director of communications for the NDP Youth of Canada, discussed the importance of a social media strategy for greater youth electoral involvement. “I designed the outreach and community strategy myself,” she said. She outlined the three-pronged strategy that the NDP followed: mobilizing the youth on the ground, developing a targeted social media plan, and engaging in a lot of youth debates and media appearances. “We wanted to empower our youth activists in various provincial wings, regional youth clubs, and campus groups by giving them the resources and training needed to support and volunteer with the local candidates. There were more ways to get involved than ever, and students really took advantage of that,” Petra said. “Ultimately youth engagement is simple,” said Matthew Campbell, fourth-year representative for the U of T Conservatives, who also worked as a summer intern for the Conservatives’ campaign. “Our formula was basic — knock on as many doors as possible, and engage with the entire family.” Although Campbell does not believe that the overall increase in voter participation reflects a major increase in youth turnout, he did remark upon on the extent of youth participation that he witnessed during the campaign. Nelson Wiseman, a political science professor at U of T, said that the high voting turnout is an anomaly and that it will likely decrease in the future. Loewen on the other hand, believes that voting turnout is likely to continue at this level. Anthony Piruzza contributes to The Varsity.